The differential cross section for the elastic scattering of unpolarized protons on unpolarized electrons at rest is calculated taking into account two mechanisms: one-photon and scalar-boson exchange. The spin correlation coefficients, when the proton beam and the electron target are both arbitrarily polarized, have also been calculated. These observables are calculated in terms of the proton electromagnetic form factors, namely magnetic and electric ones. Some peculiarities of the inverse kinematics (the mass of the colliding particle is larger than mass of the target particle) have been discussed. It was shown that all the spin correlation coefficients in the elastic proton electron collisions are proportional to the proton magnetic form factor. The same behaviour takes place for the spin correlation coefficients in the elastic electron proton scattering (the electron beam and proton target are both polarized). It was shown that only the interference of the two mechanisms (one-photon and one-boson) gives nonzero contribution to the spin correlation coefficients. If the spin vectors of the proton beam and electron target lie in the reaction plane then the corresponding spin correlation coefficients are zero for the case when scattered electron momentum is in the direction of the proton beam momentum. Fundamental Physics at the Intensity Frontier, Report of the Workshop held December 2011 in Rockville, MD, Workshop Chairs: J.L. Hewett, and H. Weerts, arXiv:1205.2671v1 [hep-ex]. Essig R. et al. Dark Sectors and New, Light, Weakly-Coupled Particles // arXiv:1311.0029v1 [hep - ph]. Alexander Jim et al. Dark Sectors 2016 Workshop: Community Report // arXiv: 1608.08632v1 [hep - ph]. Soffer Abner. Searches for light scalars, pseudoscalars, and gauge bosons // arXiv: 1507.02330v1 [hep-ex]. Pohl et R. al. Laser spectroscopy of muonic deuterium // Science. – 2016. - Vol. 353. – P. 669-673. Izaguirre Eder, Krnjaic Gordan, Pospelov Maxim. Probing New Physics with Underground Accelerators and Radioactive Sources // arXiv: 1405.4864v1 [hep-ph]. Tucker-Smith David, Yavin Itay. Muonic hydrogen and MeV forces // Phys. Rev. – 2011. – Vol. D83. – P.101702, arXiv: 1011.4922v1 [hep-ph]. Liu Yu-Sheng, Miller Gerald A. Polarized lepton-nucleon elastic scattering and a search for a light scalar boson // Phys. Rev. – 2015. – Vol. C92. – P.035209, arXiv: 1507.04399v1 [nucl- th]. Fayet P. Light spin-1/2 or spin-0 Dark Matter particles // Phys. Rev. – 2004. – Vol. D70. – P.023514, arXiv: hep-ph /0403226v1, 2004. Boehm C., Fayet P., Silk J. Light and Heavy Dark Matter Particles// Phys. Rev. – 2004. – Vol. D69. – P.101302, arXiv: hep-ph /0311143, 2004. Hochberg Yonit et al. Dark spectroscopy// arXiv: 1706.05008v1 [hep-ph]. Gakh G.I., Dbeyssi A., Marchand D., Tomasi-Gustafsson E., Bytev V.V. Polarization effects in elastic proton-electron scattering // Phys. Rev. - 2011. - Vol. C84. – P. 015212. Gakh G.I., Dbeyssi A., Tomasi-Gustafsson E., Marchand D., Bytev V.V. 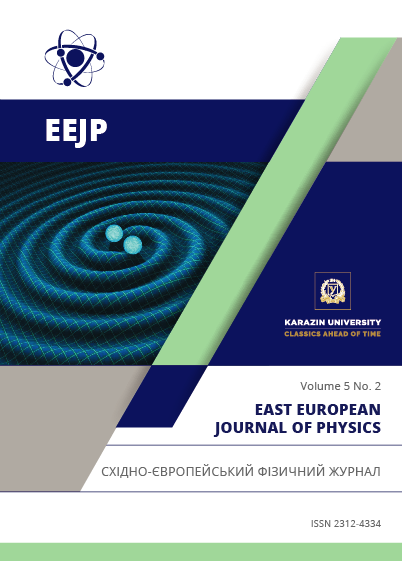 Proton-electron elastic scattering and the proton charge radius // Physics of Particles and Nuclei Letters – 2013. – No.5. - P. 393-397. Gakh G.I., Konchatnij M.I, Merenkov N.P. Tomasi-Gustafsson Egle. Radiative corrections to elastic proton-electron scattering measured in coincidence // Phys. Rev. 2017. – Vol. C95. –P. 055207. Glavanakov I.V., Krechetov Yu.F., Potylitsyn A.P., Radutsky G.M., Tabachenko A.N., Nurushev S.B. A proton polarimeter based on the elastic pe - scattering, //Nucl. Instrum. Meth. – 1996. – Vol. A381. – P. 275 - 279. Reifarth Rene, Litvinov Yuri A. Measurements of neutron-induced reaction in inverse kinematics // Phys. Rev. ST Accel. Beams. – 2014. – Vol. 17. – P. 014701, arXiv:1312.3714v1 [nucl-ex]. Akiezer A.I., Rekalo M.P. Hadron Electrodynamics . - Naukova Dumka: Kiev – 1977. – Chapter 4.